Sricharan Vadapalli did his maters M Tech from IIT Delhi, He joined TCS through campus placements. Was with a product development company for 8 years, mostly in USA. He also worked with Infosys, CSC, Virtusa Polaris and Kogentix etc, managed fortune client engagements. He is Practice Head of Data Analytics, Devops and Cloud., working with Pyramid Solutions since 2017. 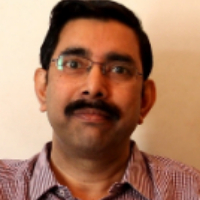 He was associated briefly with a start-up as CTO and authored few books on DevOps, Big Data and successful Relations. Big Data analytics is the often complex process of examining large and varied data sets from multiple sources called big data to uncover valuable business information including hidden patterns, unknown correlations, market trends and customer preferences that can help organisations derive informed business intelligence and decisions. "I joined IT MNC from college and worked for a Product Company for 8 years mostly in USA. I have also worked with MNC's and Startups. I am working as Practice Head of Data Analytics, DevOps and Cloud, currently with Pyramid Solutions. My books are on DevOps, Big Data and successful Relationships. Learning was my passion, I am certified SAP Hana consultant also certified in PMP, ITIL, OCA, INS21, FP, In Memory, I was always passionate about data and its value at the enterprise level hence I found my way into Big data Analytics. I have authored books on DevOps, Bigdata and relationships." Product management is an organisational lifecycle function within a company dealing with the planning, forecasting, and production, or marketing of a product or products at all stages of the product lifecycle. "I joined IT MNC from college and worked for a Product Company for 8 years mostly in USA. I have also worked with MNC's and Startups. I am working as Practice Head of Data Analytics, DevOps and Cloud, currently with Pyramid Solutions. My books are on DevOps, Big Data and successful Relationships. Learning was my passion, I am certified SAP Hana consultant also certified in PMP, ITIL, OCA, INS21, FP, In Memory, I was always passionate about data and its value at the enterprise level hence I found my way into Big data Analytics. I have authored books on DevOps, Bigdata and relationships"